The Challenge4 crew will travel the entire Pan-American Highway in a 2011 Volkswagen Touareg TDI® Clean Diesel SUV, demonstrating how the vehicle’s German engineering and powerful engine handle even the most challenging driving conditions. Its 3.0-liter turbocharged V6 TDI® Clean Diesel engine and 4MOTION® all wheel drive (AWD) system deliver the performance and durability required to tackle the many twists and turns of the Pan-American Highway. The engine provides an impressive maximum torque of 406 lbs.-ft. at 1,750 to 2,250 rpm while producing 225 horsepower at 3,500 to 4,000 rpm. 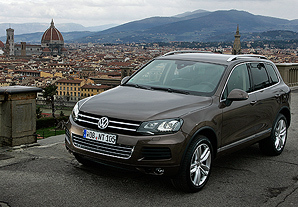 The Touareg’s TDI® clean diesel technology is a key component of "Think Blue. ", the philosophy behind Volkswagen’s approach to preserving the environment through fuel-efficient, high-performance vehicles; sustainable production and advanced technologies. The Touareg’s TDI® engine offers class leading fuel economy (28 MPG hwy/19 MPG city EPA estimates), greater power versus a similarly-sized gasoline engine, and super-clean 50 state legal emissions. 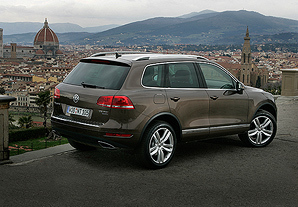 As a clean diesel, the Touareg produces up to 25 percent lower CO2 emissions than comparable gasoline vehicles. A special DeNOx catalytic converter, augmented by a special injection system that sprays a synthetic urea-based solution (AdBlue) into the exhaust, helps reduce NOx emissions by up to 90 percent, and lets the engine meet the Tier 2, Bin 5/ULEV II standards imposed across all 50 U.S. states. The vehicle's construction will provide the strength and comfort needed to conquer the distance. 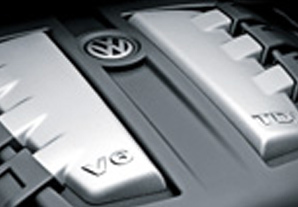 By utilizing aluminum in the vehicle's double wishbone suspension, Volkswagen reduced the overall weight of the vehicle compared to the previous model year, creating an extremely responsive and precise driving experience. When paired with the vehicle's 4MOTION® all-wheel drive system, it is capable of managing the changing driving conditions along the Pan-American Highway, including rugged terrain and mixed road surfaces at varying altitudes. The Touareg’s optimized running gear offers very good vibration control and ride comfort, a low roll angle, responsive handling and excellent dynamic stability.